Stonehenge is still one of the world's great mysteries. Who built it? Why? And how? Around 3, 500 years old, Stonehenge is a massive circle of standing stones and earthworks in the middle of a green field in Wiltshire. Whoever built the monument, Stonehenge is Britain's most important ancient monument. There is evidence that it was a burial site, and theories abound that it has astronomical, spiritual or even supernatural meaning. Unfortunately, these days a couple of major roads rush by on either side ruining the vista but Stonehenge still manages to retain its magic and mystery. People flock there at the time of the summer and winter solstices. 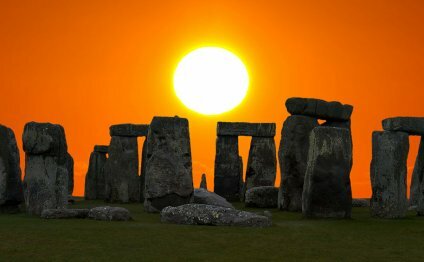 Since 1986, Stonehenge (together with nearby Avebury Henge) has been a UNESCO World Heritage Site. There are plenty of other things to see in the area, too. The town of Salisbury is 8 miles south and the beautiful medieval Salisbury Cathedral is a must. The famous Magna Carta is also housed there. Stonehenge is a couple of miles from the nearest town, Amesbury. The nearest train station is at Salisbury, connecting with London Waterloo. There are plenty of buses heading between Salisbury and Stonehenge. Alternately you can take a tour bus - either guided or unguided. If you want to get direct access to the site - and to mingle amongst the stones - then you must book a guided tour (see the 'Tours & Tickets' tab). Sacred travel, or metaphysical tourism, spiritualized travel, is a growing niche of the travel market. It attracts New Age believers and involves tours and travel to "spiritual hotspots" on the Earth.